It must be acknowledged that mentoring is not a Biblical word, yet it does describe a Biblical reality, observable in several key relationships between leaders in both the Old and New Testaments, as we will explore towards the end of this section. The Biblical terms most closely related to mentoring are μαθητεύσατε ‘make disciples’ (Matthew 28:19), καταρτισμός ‘prepare’ or ‘equip’ (Ephesians 4:12) and ποιμαίνω ‘tend as a shepherd’ (Acts 20:28; 1 Peter 5:2). Mentoring can make a key contribution to these larger concerns. · Where is God active in a Christian mentoring partnership? · What Biblical texts inform the process and outcomes of mentoring? · How does mentoring sit alongside other methods of disciple-making, preparation of God’s people and pastoral leadership? · What personal qualities and attitudes are required of those involved in mentoring? · What values must be respected in mentoring that are worthy of being called ‘Christian’? · What comes from God to the mentoree? · What comes from the mentoree to God? · What comes from God to the mentor? 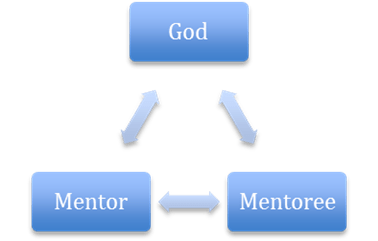 · What comes from the mentor to God? · What comes from the mentor to the mentoree? · What comes from the mentoree to the mentor? In Mentoring Matters, Lewis cites several relationships between people in the Bible that display some of the attributes of mentoring. We should be careful not to advance these as precise, definitive examples of mentoring. They might be more accurately identified as Biblical precedents of mentoring in the sense that we use the term today. They are, nonetheless, useful in identifying how God has been pleased to use human relationships in the past to further his work of forming leaders for his mission in the world. Reflections on Biblical relationships that help us understand the potential of mentoring may also be found in Mallison and Horsfall. Their definition reads, “A triadic relationship between mentor, mentoree and the Holy Spirit, where the mentoree can discover, through the already present action of God, intimacy with God, ultimate identity as a child of God and a unique voice for kingdom responsibility.” Anderson and Reese, Spiritual Mentoring: A Guide for Seeking and Giving Direction. Downers Grove: IVP, 1999, p. 12.